Highline Properties, LLC is a female owned development company founded by Marcia Busching. 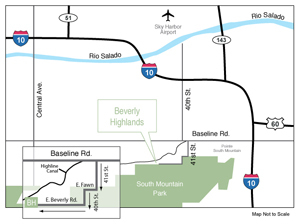 A South Mountain resident herself, and a long-time Valley of the Sun resident, she has a passion for high quality development for the discriminating buyer. With an outstanding team of professionals to make her vision a reality, the lots in Beverly Highlands are truly unique and magnificent. A portion of the proceeds from the sale of each lot will be donated to Habitat for Humanity. Lots are now available for sale! This site and the related links do not constitute an offer to sell real property. The materials provided at this site are strictly for information purposes and shall not be construed as an offer in violation of the law of any jurisdiction. Obtain the Subdivision Public Report before signing anything. No Federal or State agency has judged the merits or value, if any, of this property. No binding offer to sell or lease may be made or accepted prior to issuance of the final Arizona Subdivision Public Report for the property. All pictures on website have been taken from the property.